The game of golf game cuts through the corporate hierarchy and allows women to be part of “the club”, an informal network that seems to form on the golf course. This is often where the best opportunities come to fruition and where exposure to the best contacts occurs. Golf is an invaluable bonding and social experience for those in the business world. My company, I cofounded with business woman Sue Mcmurdy, presents customized and 3- day Premier Events for the Business Woman! We want more women out on the Course!! Check out our totally separate website for this specific purpose-www.BusinessGolfAcademy.com Also, go to our Facebook page for great articles and information on women’s golf and women’s leadership. Guests are treated to Missie’s detailed Keynote; “Going for the Green- Women Say Yes!” on how to conduct Business Golf and we close with Missie’s One hour Indoor session on Golf Instruction! I conduct this 1/2-day indoor workshop on how to swing, how to maneuver your way through a day on the course, how to know the golf etiquette and lingo and how to be involved -even if you don’t consider yourself a golfer. You’ll learn easy-to-use techniques on how to swing, invaluable information on how to interact and the do’s and don’ts of “playing with the guys.“As a bonus to the program, I will provide an autographed copy of my latest book “The Mental Mastery Program,” which outlines how to handle embarrassment on the course, doubt and the confidence issues around trying to look good. These fears are exactly what the corporate woman is dealing with on the course! I attack these fears head-on so that you can feel confident on the course. This is the weekly class in my city (Pittsburgh)! 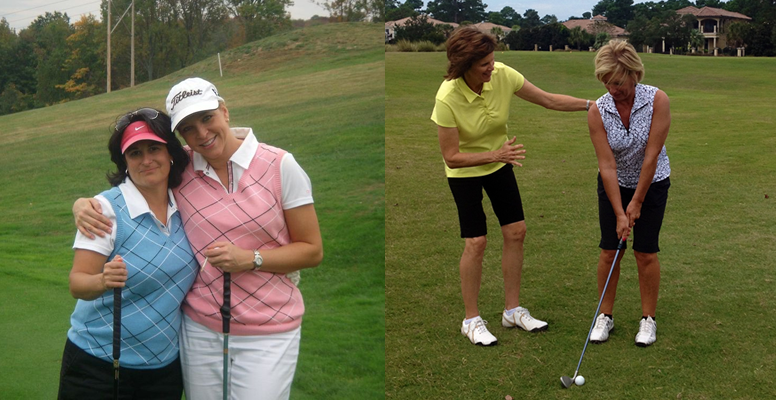 Missie Berteotti holds the title of a TPI Certified Golf Fitness Instructor. (Titleist Performance Institute) Missie offers a 90 minute class that involves golf simulated exercises that develop the swing motion and strength in that motion! Students do a lot of actual swinging in the class while hitting plastic balls. Great improvement happens here, where emphasis is on technique and balance – without the presence of performance. It’s a great environment for developing your golf technique and golf fitness. Email me to make your personal times for your group. To learn more, check out the “Fitness & Performance Classes“. – A former participant in one of Missie’s workshops for corporate women.